Caspian tigers, some of the largest cats that ever lived—up to 10 feet long and weighing more than 300 pounds—met a grim end in the middle of the 20th century. Until the mid-1960s when they were designated as extinct, they ranged from modern-day Turkey through much of Central Asia, including Iran and Iraq, to northwestern China. The reasons for their extermination are many: poisoning and trapping were promoted by bounties paid in the former Soviet Union until the 1930s; irrigation projects during the Soviet era destroyed the tugay woodlands (a riparian and coastal ecosystem of trees, shrubs and wetlands) and reed thickets that were critical tiger habitat; and the cats' prey disappeared as the riparian habitat vanished. But there is a chance that tigers—using a subspecies that is nearly identical, genetically, to the extinct Caspian—could be restored to Central Asia. A study published online in the journal Biological Conservation lays out the options for restoring tigers to Central Asia and identifies a promising site in Kazakhstan that could support a population of nearly 100 tigers within 50 years. 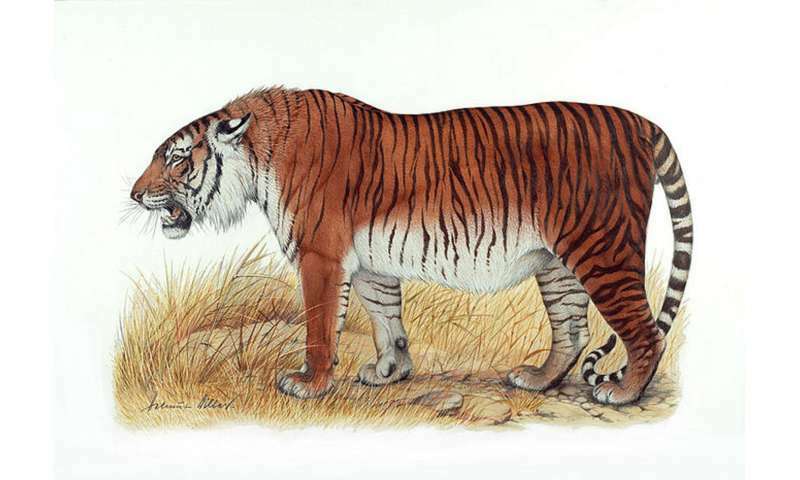 "The territory of the Caspian tiger was vast," said Professor James Gibbs, a member of the research team and a conservation biologist who is director of the Roosevelt Wild Life Station at the College of Environmental Science and Forestry (ESF) in Syracuse, New York. "When they disappeared, the number of nations that hosted tiger populations was reduced by more than half." The researchers say introducing tigers in a couple of locations in Kazakhstan won't make a widespread difference immediately but it would be an important first step. "The idea of tiger reintroduction in Central Asia using the Amur tiger from the Russian Far East as an 'analog' species has been discussed for nearly 10 years. 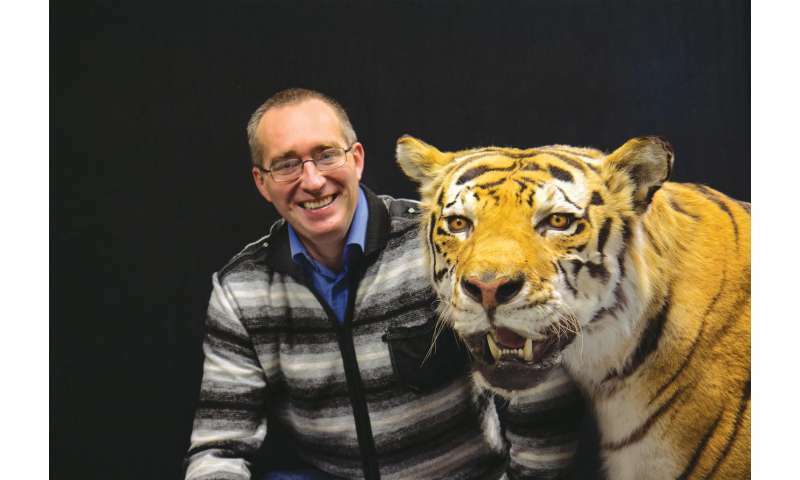 It met with considerable support from the government of Kazakhstan in 2010 during the Global Tiger Forum in St. Petersburg, Russia," said Mikhail Paltsyn, an ESF doctoral candidate who oversaw analytical aspects of the study. "But the program needed a strong scientific foundation to evaluate the full habitat potential for tigers and to better explore different possible outcomes of the reintroduction in different scenarios," Paltsyn said. In addition to Paltsyn and Gibbs, the research team includes ESF scientists Liza Yegorova, a recent master's graduate; Dr. Igor Chestin, director of WWF-Russia; and Dr. Olga Pereladova, director of WWF Central Asia Program. Paltsyn is a member of the International Union for Conservation of Nature Cat Specialist Group and has served as a consultant with the World Wide Fund for Nature (WWF) and United Nations Development Programme. The breakup of the Soviet Union and introduction of market economies in newly established states has led to the recovery of tiger habitats in some areas as state-sponsored agricultural programs along rivers were abandoned. Recent work in phylogenetics (the study of evolutionary history) indicates Caspian tigers were closely related to Amur tigers that still exist, making Amur tigers a likely "analog" species for restoration of tigers to the region. But Paltsyn laid out the challenges that would need to be addressed before tigers start roaming the landscape again. "First, it is necessary to stop riparian zone degradation caused by uncontrolled fires. Second, it is vital to restore wild ungulate (broadly defined as a hoofed mammal) populations in the area. That, alone, could take five to 15 years," Paltsyn said. "Third, human safety and socio-economic benefits for local populations need to be addressed to provide a sustainable future for both tigers and people. And, finally, water consumption from the Ili River needs to be regulated in both Kazakhstan and China to support sufficient water level in Balkash Lake for tugay and reed ecosystems - the main tiger habitat. However, WWF and the government of Kazakhstan seem to be ready to deal with all these difficult issues to bring tigers back to Central Asia." Tiger reintroduction has support from the Kazakhstan government and local communities because of potential economic benefit from wildlife tourism, small-business growth and employment opportunities at Ili-Balkhash Nature Reserve. In the study, the researchers analyzed scientific literature that revealed Caspian tigers once lived in an area about 800,000 to 900,000 square kilometers in size (between 300,000 and 350,000 square miles), mostly within isolated patches of riparian ecosystems (land along rivers or streams). Generally, two or three tigers occupied an area that covered about 100 square kilometers (about 40 square miles). Spatial analyses based on remote sensing data indicated that options for Amur tiger introduction are limited in Central Asia. But at least two habitat patches are potentially suitable for tiger re-establishment, both in Kazakhstan. When the researchers considered current land use and the low density of the local human population, they found the most promising site is the Ili River delta and adjacent southern coast of Balkhash Lake. The river flows from northwestern China into southeastern Kazakhstan; it drains into Balkhash Lake, the 15th largest lake in the world. The team identified about 7,000 square kilometers (about 2,700 square miles) of suitable habitat. Population models for animals that tigers typically prey on—wild boar, Bukhara deer and roe deer—suggest the area could support a population of between 64 and 98 tigers within 50 years if 40 to 55 tigers are introduced. The Amur tiger is apparently the only subspecies that has significantly increased in number in the last 65 years. Scientists estimate some 520 to 540 still live in the wild. Moving some of them from the Russian Far East to the Ili River delta could be enough to eventually establish a wild population in 50 years, and would not harm the Russian population, the study says. Around the world, similar relocation programs have worked for cat populations. The study says: "... case studies suggest high adaptive potential of big cats to novel environments. We know of no large cat translocation programs that failed strictly due to maladaptation of source population to environment of release." I think 300 pounds is a typo. Should be kilograms.